The three contenders in a showdown for the 2018 FIA World Rally Championship (WRC) top a list of 29 entries confirmed for Kennards Hire Rally Australia. Points leader Thierry Neuville, defending five-time champion Sébastien Ogier and fast-finishing Ott Tänak will represent Hyundai, M-Sport Ford and Toyota respectively in the WRC finale on the New South Wales Coffs Coast on 15-18 November. The entry list features 11 factory-supported Word Rally Cars – three each from Toyota, M-Sport Ford and Hyundai and two from Citroën – plus competitors in the WRC 2 and WRC 3 championships and a strong Australian contingent led by CAMS Australian Rally Champion (ARC) Eli Evans. Evans’ three rivals for this year’s ARC, Harry Bates, Steve Glenney and Molly Taylor also are cross-entered in the WRC section of the rally. The 29 crews represent a total of 16 countries, including Finland, Chile, Ireland, Japan, India and New Zealand. The 26th WRC Rally Australia will test drivers and co-drivers over a heavily-revised course totalling 318 kilometres of rural and forestry gravel roads. It’s expected to provide a thrilling spectacle as Neuville, Ogier and Tänak fight out the closest drivers’ championship in years. Heading into this weekend’s penultimate 2018 round at Rally Spain, 2017 Rally Australia winner Neuville has 189 points to Ogier’s 182 and Tänak’s 168, but none can win the title before Australia. 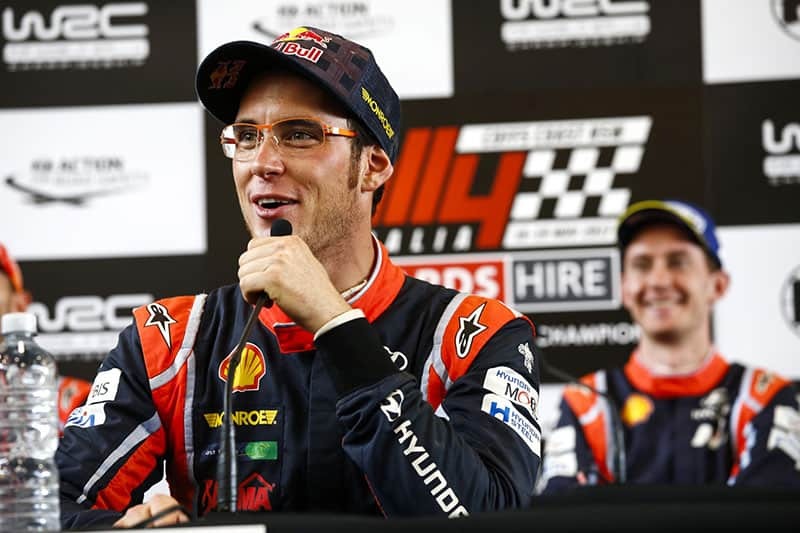 Thierry Neuville will be hoping to claim his first WRC title in Australia. “A fantastic line-up of the world’s fastest rally drivers and cars has entered Kennards Hire Rally Australia,” event Clerk of the Course Wayne Kenny said. “Drama and unpredictability are always waiting in the wings in the WRC and with Rally Australia being the deciding round for the first time in many years, the action will be awesome. Entries in the final and deciding round of the CAMS Australian Rally Championship, plus the R6 Digital Cup and Rally Australia Classic Cup support events will be announced soon. Tickets to Kennards Hire Rally Australia are on sale at www.rallyaustralia.com.au. A variety of viewing options is available, including the $99 Get Me Everywhere pass with adult access to all stages over three days.